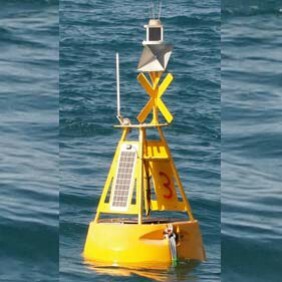 The OMC-7006 data-buoy is ideal for environmental monitoring projects. It is specifically designed for the measurement of hydrological parameters in lakes, rivers, estuaries and coastal zones. The OMC-7006 is often used near dredging sites to monitor the impact of the dredging activities. The OMC-7006 is equipped with the OMC-045-III data logger, which has proven itself in many applications. This logger contains integrated GPS and GPRS, and can be interfaced to radio and satellite modems. The OMC-045-III supports several analogue and digital inputs for communication with the sensors. This allows the logger to be connected to almost any water quality sensor on the market. 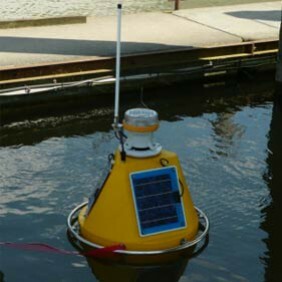 The electronics and underwater sensors can easily be removed for maintenance, without taking the buoy out of the water. Integrated data logger with: GPS and GPRS (data communication via the mobile phone network). SMS alarm function on all parameters. Event controlled logging interval. Optional radio or satellite modems. Easy to use configuration software. Solar powered, one or two 12 Volt 12 Ah batteries. Easy access to sensors and electronics without removing the buoy from the water. The OMC-7012 data buoy is ideal for environmental monitoring projects. It is the bigger brother of the popular OMC-7006 data buoy. Both are specifically designed for the measurement of hydrological parameters in lakes, rivers, estuaries and coastal zones. The OMC-7012 can also support meteorological instruments. The OMC-7012 is equipped with the OMC-045-III data logger, which has proven itself in the OMC-7006. This logger contains integrated GPS and GPRS, and can be interfaced to radio and satellite modems. The OMC-045-III supports several analogue and digital inputs for communication with the sensors. This allows the logger to be connected to almost any meteorological or water quality sensor on the market. Solar powered. Various battery and panel configurations are possible. Prepared for hydrological sensors from YSI, INW, ANALITE. Flexible enough to support many more brands.